On February 2, I had surgery. For me, my physical and emotional inability to quickly resume to an active lifestyle after the surgery (I expected to be off and running within two days!) led to being overwhelmed with feelings of helplessness, tested my resilience, and challenged me to continue to be optimistic —- to have hope. 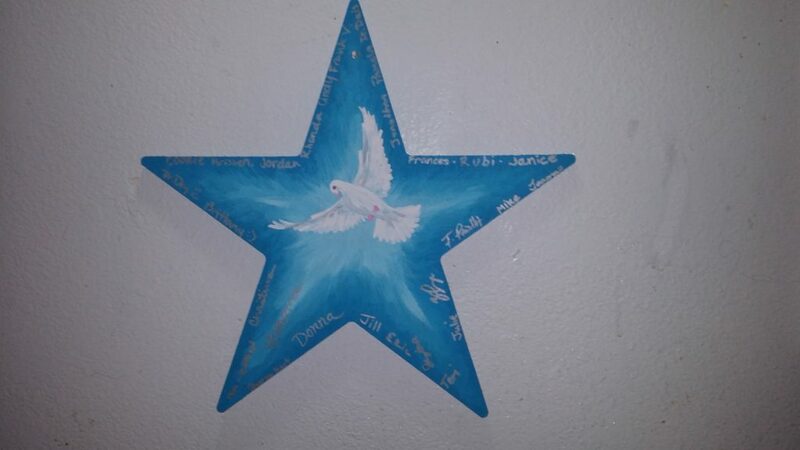 Before surgery, I was blessed to receive the good feelings of helping others by designing stars at a Corporate Volunteer painting event at the Humane Society of San Bernardino Valley (HSSBV) and with children creating and sending Stars of HOPE. HSSBV staff and volunteers came to the Joyce Martin Auditorium during their lunch to make stars. It was suppose to be a two day event, yet a week later, people were still painting! Being involved with HSSBV’s Corporate Volunteer painting event, I have been on the “giving” side of Stars of HOPE. However, now, I am on the “receiving” side. My Star of HOPE, created and designed by HSSBV staff, sits in a prominent place in my home and will soon be in my office at work(!) — a constant reminder of the hope that comes from caring people. As a recipient and being involved with making Stars of HOPE, I strongly urge you to become involved with the magic that comes from making, seeing, and receiving these miraculous little six inch wooden stars. Making them is good for your heart and good for someone else’s heart! Make one and give it away. Make a box and send them to a community who has experienced a disaster. There are many origins of tragedy and as such, many types of consequences and suffering. Tragedy and disaster can be man made, environmental or personal. But the affected individual or community can still benefit from encouragement. Please remember that you have the ability to change a life and to motivate a community. I thank my family and friends, HSSBV staff, and Stars of HOPE for filling me with renewed strength and courage! Hoping you have a hope filled day!